Krash has recently turned 3, which means it is time to begin the slow transition from child-led Tot School to Mommy-led school. This is not an easy transition and one I struggled greatly with when homeschooling my oldest son during Pre K. Let me begin this post by saying that every idea I present in this post might fail!!! I have not managed this transition successfully in the past and Krash will be the first child I will have completely Tot-Schooled at home and then brought up into PreK. Pac Man attended a 2 day per week pre-school when he was 3 and that accounted for much of our problem with Pre K. Most of it was him missing “Going School” as he called it. So, as you read, please know that these are just my ideas, not my stories of success! Krash turned 3 in May 2009. I plan to begin a more formal Pre K program with him in the fall of 2010, when he is about 4 1/2. This is when Pac Man began Pre K and we moved at his pace, I plan to do the same with Krash. I do not push my kids, however I love that homeschooling allows them to move at their own academic pace. My plan is to slowly transition Krash from being the leader of school into being more of the teacher-led student. I do not un-school (I personally think it’s neat I just could never handle it myself! ), therefore I believe we need to make this transition. I say SLOWLY as I do not want to squash his love for school and learning. If you read my FAQ page about tot school, you will see a long version of what I believe about educating young children. I will still believe this as he goes through this next year and even in the next couple of years, but there will be more teacher-led learning along the way! I am one of those “pick your battle” type of moms. I will fight the big battles in discipline and I will win. I love the quote from Dr. Dobson’s book, The New Dare to Discipline… “when you are defiantly challenged, win decisively.” Basically that we don’t have to engage in every disciplinary battle but when we do choose to engage, we, the parent, MUST win the battle. If we do not-it begins a path of destruction to the child’s idea of who is really in charge. I firmly believe that God is in control of my life and He has placed me as the earthly parent of his children. Although I do not fully understand God’s ways and probably will always fail-I am always trying to be the type of parent God desires me to be. They are after all, HIS children. All that said, I believe this applies with the transition I speak of. I will slowly introduce me as the lead teacher(and decision maker) in small ways. Already I have begun to expect Krash to complete a puzzle when he begins one. He often likes to do half and I used to let him. Now, I am expecting him to complete what he starts. 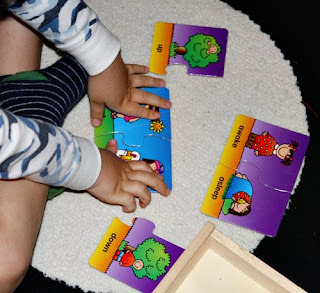 He battles with me at times, but I remain firm-he always finishes the puzzles now-even if it is with my hand guiding his and him screaming at me :). Below are 2 examples of puzzles he did not choose and did not want to complete…at first. After I convinced him they were fun, he became engaged. 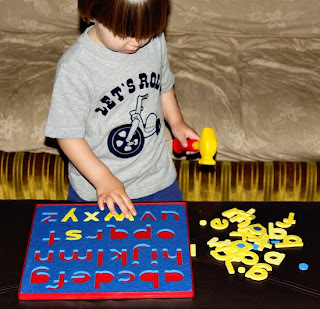 He did NOT want to complete the ABC puzzle, but I required him to. Afterwards he felt a great sense of success as we high-fived!!! If he is doing a tray activity, I require him to clean up the tray. I do NOT require him to stay with the tray long-if he’s not interested after a few seconds, that’s fine. I AM requiring him to clean it up. We have always worked on cleaning up, but now it is being enforced all the more. If an activity has a clear ending point, I will begin to enforce following through until it is completed. Activities like bead stringing, lacing, drawing, Play-Doh, and others that don’t have a definitive ending point, I am still letting him be the leader with. An example is pictured below. When he said he was done with the stickers, he was done and that’s fine with me! I am not transitioning in the area of choosing activities yet, I am still letting him choose from the activities being offered on his shelf. On the shelf below, I really wanted him to work with the abc beanbags, he did not choose them yet and it has been over a week. I took them off for this week and will try again later! I will sometimes ask if he wants to do a particular thing and show him how, but I will back off if he’s not interested. Gradually as the year progresses this will change. We are all at differing stages of tot-hood, as the age range I suggest- 12-47 months- is a very wide one. It is also a wide developmental range. Please keep this in mind as you read through the ideas of others. I have asked Tot School participants to put their tot’s current age in ( ) after their post on the Linky-I hope this helps you when you are surfing for ideas. Also, please remember that even though specific ages are often given, ALL tots are different. 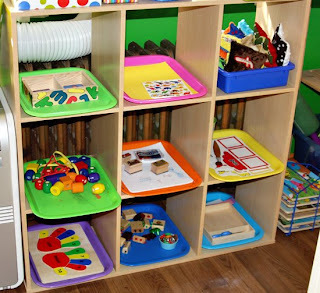 Here’s some general thoughts about Tot-Schooling during this period. 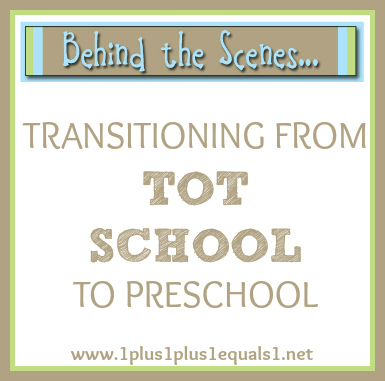 The 12 month tots…you are transitioning into Tot School, very slowly. It is basically what you’ve been doing ALL along-playing with your baby. Your own mind just becomes more intentional as you make sure you play each and every day with a variety of toys. This transition will gradually become more and more focused as the year goes on. Keep two words in mind-FOCUS and FUN. Just become more focused while having fun with your young tot. The 24 month tots…this is the heart of tot school time in my opinion. It is the true child-led portion for most tots. This is the stage we have been in the past year and I have posted the most about. 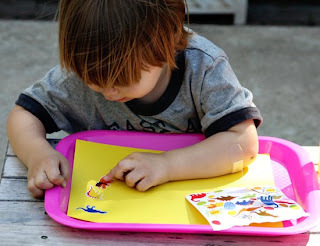 The 36 month tots… This is the stage I am writing about in this post-the tots who are spending their year preparing for Pre K. Some tots will need longer than a year to be ready for a more formal Pre K, some will be ready before they are 4. My beliefs regarding readiness are very simple. The child must be ready both academically and emotionally. I believe Krash will be ready academically long before he is ready emotionally. With Pac Man it was the opposite. Every child is different and that’s the glory of homeschooling, we can meet our kids where they are at! I know my own personal beliefs may not jive with yours, we all have them and they are rarely the exact same! I share my thoughts in case someone can glean some insight from them. Again, I am not saying my way is right, or even works…it’s just the route I plan to take! I will keep you updated as we continue on our journey! Then-I will begin all over again as my little girl will be turning 1 right when Krash is turning 4! Tot School is no where near over for us! Tot School ~ Birthday Boy!!! !